Learn how Grou creates their client presentations in 2 days, rather than 2 weeks. Also, see how they use our Goals and Client Performance tools over the course of the month. “We used to create a really visual presentation so the customer understood what we were doing. We didn’t really invest time in analyzing the data and to know what was going on and ways we would be better the next month. What tools were you using to make those presentations before Databox? Martha: Just Keynote for the presentation with screenshots from all of our different tools. How has life changed since you started using Databox? M: I think we’ve been much more productive in terms of establishing objectives for the month and for the 90-day plans that we create. Now, we can monitor those results and see what we have accomplished this quarter and what we’re going to do next quarter. 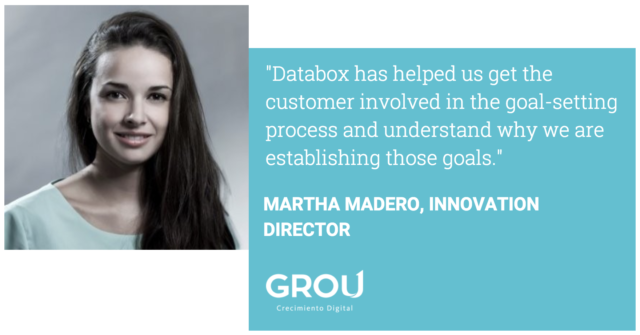 Databox has helped us get the customer involved in that and understand why we are establishing those goals. How do your clients learn about Databox in the first place? M: We’ve done it differently with some clients at the beginning. We rolled it out to our oldest customers and we told them that they have this new tool that will help them track their performance in real time. They were really excited about it. Some of them were more resistant, to be honest. They were used to the presentations we already did. We did a slow transition where we started including screenshots of Databox dashboards in the presentation. For others, we introduce them from the sales perspective where we analyze some of their data that they give us before they become our customers. They always love how it’s really clean and easy to understand. We need to really make it simple for them in the sales process and only show around three types of a Databoards. What do you guys talk about in that sales process? M: We show them that we understand their data so they know we are the experts and they can trust us with their information. In the beginning, they just give us insights into their Google Analytics account for example. They want to know what we can do with that data and how we interpret it and how we can give them results. We try to build really concise dashboards that can demonstrate what we’re going to do based on what they’re doing right now. Do you set any concrete goals with clients? We are also partners with Smart Insights. They have a really good methodology to build these plans and so we establish these goals with the customer. Otherwise, we would just run any campaign and see what works. We’ve done that previously and that hasn’t worked. Now, we’re now establishing these at the beginning. First, we ask where they want to be in three years. Then, we establish a one year plan and we create pieces of the 90-day plan so they have at least three clear objectives and those three objectives give us the tactics and actions we need to be doing. What kind of metrics do you use in the 90-day plan? M: We prioritize based on a matrix called RACE that Smart Insights established. It’s very similar to the inbound marketing methodology. So we want to grow that in the three-year picture and we try to tell them that digital marketing will help them have a return on investment. They are not doing this as an expense. What kind of activities go into that initial 90-day plan? M: It depends on the maturity of the customer. We use another framework from Smart Insights called the “digital roadmap to marketing excellence”. We see which level is the best fit for the customer, then we establish quality metrics based on the revenue goals. But if they are really early in the roadmap, we are trying to help them build marketing infrastructure. So we connect HubSpot, we start analyzing their conversion rates, we integrate the CRM system into their processes and we start doing the basics. Then we start building metrics that are related to their business goals. Do you have any processes throughout the month to check in on data? M: We do with some customers. We will have a weekly meeting, but not with all of them, to be honest. It depends on how the customer wants to work with us. At the beginning of almost every retainer, we have weekly meetings because we have to speed up the learning curve and we have to extract information from them. Even after that period ends, we have internal meetings weekly with our account team and we try to use a functional model of “development and shaping” from David Baker. The “shaper” tells the team how well we’re doing, and if we’re not doing well, what we need to change. This happens on a weekly basis and it is a continuous improvement process. If we are doing well, the account managers can meet with the client and tell them everything is going well. If it’s not, we need to create some key findings of what is going on and what are we going to do before the month is over. This is especially important within the trimester and the 90-day plan. Is there any specific Databox feature that you’ve been using in those meetings? M: Yeah, we use Goals and the Client Performance tool which really helps us to see if we are going to be able to reach those 90-day goals. They have to be in touch with their metrics and we don’t hide anything from them. Want to get a firsthand look at how agencies like Grou use Databox to automate their client reports, set client goals, and much more? Sign up for one of our live agency demos.